Toyota of Vero Beach - Toyota of Vero Beach near Port St. Lucie and Palm Bay offers new and used car for sale, service, parts, financing for Toyota cars, trucks, hybrids, and hybrids. 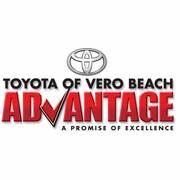 Regardless of what type of Toyota vehicle you are interested in purchasing, Toyota of Vero Beach near Port St. Lucie has got you covered! We feature an outstanding selection of new and used Toyota vehicles, and we are almost certain you will find the perfect Toyota vehicle to fit all of your needs. Whether you are looking for a big SUV to pile the family in, a rugged truck for heavy towing jobs, or a luxurious car to show off to your friends, you will be able to find it all at Toyota of Vero Beach. The extensive inventory of new vehicles at Toyota of Vero Beach includes something that you will just love. All you have to do is stop by and take a look at all of the quality vehicles we have in store!